There were many times when I've wanted Lily to wear flats for a photo. They are stylish and tacky-free. Unfortunately, it's surprisingly difficult to find children's ballet flats. Then I came across this nifty tutorial on how to make them yourself! Adults and kids alike! Pictured to the left is a homemade pair I loved on etsy by hydraheart. Another cute mary jane tutorial for kids is here on Craftzine. Those are so adorable! I would love to make those for my two nieces. Thank you sooooooo much for posting this link! They are adorable! These would be brilliant for my youngest... I've just bought some flats for her and she's already saying they're too small! These are way cuter too! 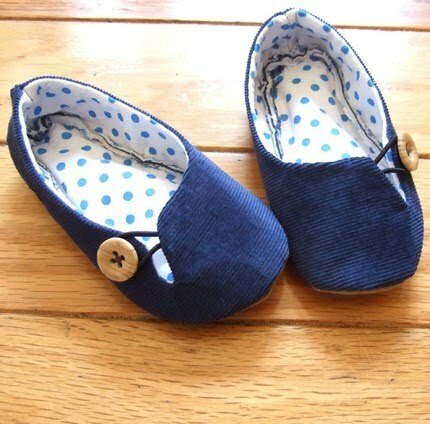 AAAHHH - they are brillant - about to try at pattern to make slip ons from Sewing with a French twist - love to try these!! Too cute! Are ballet flats just as easy to make in larger sizes? This could be a great gift idea for friends! Not to mention I usually have to look for large shoes for women since most stores won't carry my size. But now I can make them myself, and in any way/color I want to! Very cute! I made myself a pair of suede moccasins once. I love those. I'll have to try these too!